If you want an affordable floor that will last you a long time and still looks nice, stained concrete floors are your best option. They can go anywhere but are typically used in high-traffic areas or areas that need to be more durable such as basements, garages, kitchens, mudrooms, and bathrooms. Don’t let the idea of concrete turn you off, though. One of the more popular interior options for concrete is to give it a glossy stain. Also, concrete doesn’t actually have to look like concrete. Through staining and stamping processes, concrete can mimic the appearance of wood, natural stone, marble, or tile. Same as tile or marble, concrete is unlimited in its colors and patterns. It’ll also stay true to its color. You won’t have to worry about the stain fading, chipping, or peeling. The stain literally stains the concrete. And you know how tough stains are to get out! With a sealant, your floor will stay looking new. Acid-Based Stains – react chemically to the concrete’s composition. They can create a translucent, marble effect. Water-Based Stains – fill the pores in concrete’s surface. Since it isn’t a chemical reaction, a consistent color is more likely. It’s both durable and doesn’t need much to stay looking new. To protect the stain, a sealant is added to outdoor concrete and will occasionally need to be resealed as needed. Indoor concrete floors should have a wax applied occasionally. Other than that, the only upkeep is to clean it as it gets dirty with a dry mop or an occasional wet mop with a neutral-pH cleaner. There are some factors that can impact the final result of your stained concrete floor such as its condition, age, and surface porosity. 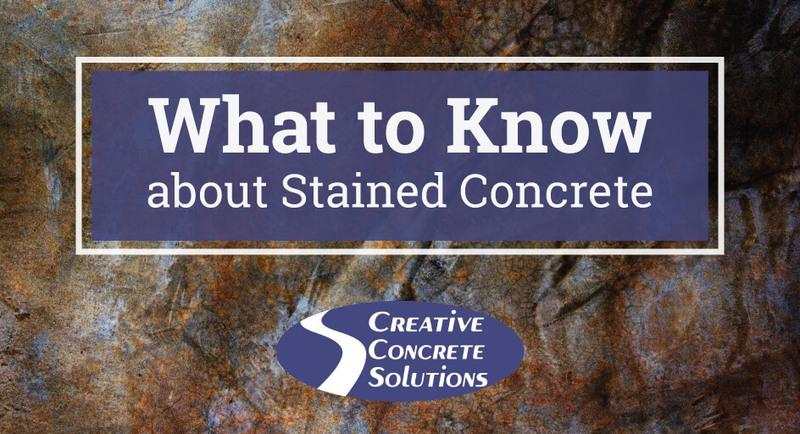 Its history can also factor into how the stain reacts to your concrete. If there were previous spills, glue, or coatings, some of the stain may penetrate the concrete unevenly.